The Brush tool in Photoshop Elements creates soft-edged strokes. How soft those strokes are depends on which brush you use. By default, even the hardest brush has a slightly soft edge because it’s anti-aliased. Anti-aliasing creates a single row of partially filled pixels along the edges to produce the illusion of a smooth edge. You can also get even softer brushes, which employ feathering. When you use the Brush tool, you benefit immensely from the use of a pressure-sensitive digital drawing tablet. The awkwardness of trying to paint with a mouse disappears and leaves you with tools that behave much closer to their analog ancestors. Airbrush: Click the Airbrush button on the Options bar to apply the Airbrush mode. In this mode, the longer you hold down the mouse button, the more paint the Brush pumps out and the wider the airbrush effect spreads. Brush tool settings on the Options bar. Tablet Options: Click the down-pointing arrow between the Airbrush button and the Brush icon. If you’re using a pressure-sensitive digital drawing tablet, check the settings you want the tablet to control, including size, scatter, opacity, roundness, and hue jitter. The harder you press with the stylus, the greater the effect of these options. Fade: The lower the value, the quicker the stroke fades. However, 0 creates no fade. Hue Jitter: Vary the stroke between the foreground and background colors. The higher the value, the more frequent the variation. 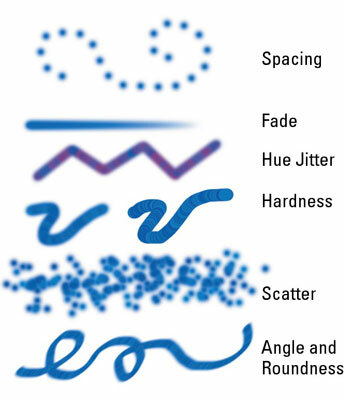 Scatter: The higher the value, the higher the number of brush marks and the farther apart they are. Spacing: The higher the number, the more space between marks. Hardness: The higher the value, the harder the brush. Angle: If you create an oval brush by adjusting the roundness, this option controls the angle of that oval brush stroke. Roundness: A setting of 100 percent is totally circular. The lower the percentage, the more elliptical your brush becomes. Change brush options to create a custom brush. You can lock in these brush dynamics by selecting the Keep These Settings For All Brushes check box, ensuring that every brush you select adopts these settings. Save Brush: Allows you to save a custom brush as a preset. Rename Brush: Don’t like your brush’s moniker? Change it with this option. Delete Brush: Don’t like your entire brush? Eliminate it with this option. The display options: Not a single command, rather a set of commands that enable you to change the way your brush tips are displayed. The default view is Stroke Thumbnail, which displays the appearance of the stroke. These commands include Text Only, Small Thumbnail, Large Thumbnail, Small List, and Large List. Reset Brushes: Reverts your current brush library to the default. Load Brushes: Loads a preset or custom brush library. Save Brushes: Saves custom brushes in a separate library. You can also manage brush tip libraries by using the Preset Manager.